Lantern clocks were the first domestic clocks ever made in Britain and are a fascinating field. They have not been greatly studied, at least not until very recent years, and then by only a handful of enthusiasts. Those of us, who look, still make new and interesting discoveries about these clocks and their makers, who worked some three and a half centuries ago. These clocks are seriously old, yet little understood. What seems exciting to me is that the novice has just as much chance of discovering some new aspect of these clocks as the experienced. It is generally thought that the men who made the first British clocks, lantern clocks in particular, bought at least some of the cast brass parts they used from specialist brassfounders or brass casters, as opposed to making their own castings. Some of these brassfounders left an impressed symbol as a trade mark in the castings they supplied. The 'matchstick man' is a name given to the small figure of a man which appears on castings on a number of mid seventeenth century clocks. This casting mark has so far been described and discussed in George White's mammoth book, 'English Lantern Clocks', based on information supplied by Jeremy Evans of the British Museum on fifteen different clocks, the majority of them lantern clocks. It has been suggested that the term is not aptly chosen, but once these terms come into use it is difficult to change them. One suggestion is that the symbol stands for the name of the brassfounder - such as someone called Mann. 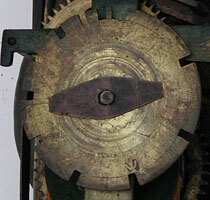 This 'matchstick man' casting mark appears on the countwheel of the William Selwood clock of the 1640s pictured in plate 1, and also, though much more indistinctly, on the star (called the ratch) behind the dial wheel. We can deduce that the brassfounder, who used the matchstick man symbol, supplied several different lantern clock makers. It may be that he was one craftsman, but it seems more likely that it was his 'company' mark, for the makers who bought his castings are spread over a span of years which seems longer than the working life of one man. That period must begin about 1640 or a little before and extend to at least 1665 or later, perhaps even as late as about 1680. We cannot pin this down accurately, for, though we know several makers so far who used it, we do not know the precise dates of those of their clocks, which carry the matchstick marks. In fact seven different makers of lantern clocks are known to have used parts bearing this mark on one or more of their clocks, plus one or more makers whose work was unsigned, plus three makers of bracket clocks. The great majority of these lantern clock makers worked in London, in Lothbury and nearby. They included: William Selwood (working 1628-d.1653), Thomas Knifton (working 1640-d.1667) and his successor, John Ebsworth (working 1665-d.1699, Peter Closon (working 1630-1660), Nicholas Coxeter (working 1646-d.1697), Hilkiah Bedford (working 1653-d.1689) and John Lyon of Warrington, Lancashire (working 1658-1678). Of these Hilkiah Bedford worked in Fleet Street and was really a mathematical instrument maker, by whom very few clocks are known. John Lyon is known only through a single clock, which he bought from some unknown Lothbury maker to retail in Warrington, where he was principally a turret clock maker. So we can more or less forget these two makers. The likelihood is that the matchstick mark has been noted mostly on clocks by Closon, Knifton, Ebsworth and Coxeter simply because their lantern clock output far exceeded in number examples by any other makers, which means more of their clocks have passed through the hands of restorers with consequently far higher chances of these marks being noticed and recorded. If we were to make a guess, we might suppose that those several matchstick-mark clocks of this group, which were left unsigned (probably to sell to others in the trade) would have been made by one or other of these four makers - and more than likely by one of the three based in Lothbury, since Peter Closon was in a bit more of a separate world of his own, both in location and in his style, which varied somewhat from that of the Lothbury makers. 1. Balance wheel lantern clock by William Selwood of the Mermaid in Lothbury, London, c.1640. Closer view. 2. 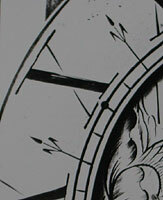 Close-up to show the Selwood countwheel matchstick man in detail. Closer view. Just as many of these lantern clock makers used castings from a common supplier, so too did they share engravers. There is often a great similarity in the engraved dial centres, alarm discs, and chapter rings of makers in this group, the Lothbury ones in particular. One feature I have noted in common on many chapter rings of this period is one style of half-hour marker, which takes two basic forms. It too has a bit of a 'matchstick' look about it and could be seen as a stylised flower with a stem, two side shoots and a head (plate 3). Ask a child to draw you a flower, and this is what he will draw - a skeletonised profile. A much less common version has two sets of side shoots, the second pair growing upright near the flower head (plate 4). Many of these makers used both versions of the matchstick flower, on different clocks that is, not on the same clock, though the great majority used the single flower version. It is difficult to be adamant about these things because we can count only those examples we are able to examine. My remarks are based on documenting as many as I could, which comes to over one hundred lantern clocks with one or other type of matchstick flower. These were made by close on fifty different makers whose lantern clock chapter rings had this 'matchstick flower' as a half-hour marker, either in double or single form on at least some of their clocks, though not necessarily all of them. They include all those lantern clock makers known to have used matchstick man castings. From certain records of the day we know the name of a few engravers, but by and large we have not the faintest idea of what their work looked like, nor for which clockmakers they worked. There is one exception in Thomas Smyth or Smith, a name unfortunately so common that we cannot hope to carry out any research into his life. We do know that Smith worked for William Selwood in the years leading up to the latter's death in 1653. In his will William states 'Item: I doe forgive and release unto Thomas Smyth, graver (we would say engraver) all such monies and whatever else hee oweth unto mee. Item: I do give unto his sonne, Thomas Smith, ffive pounds to be paid unto his father for his use, and his discharge to my executor for the same to be sufficient'. Even Selwood could not decide whether to spell his name as Smyth or Smith. It is very unlikely that William Selwood paid out good money to other engravers when Thomas Smith was already in his debt. Probably William let Thomas work off some of that debt in engraved work. This means that when we see a Selwood dial, we are probably looking at the work of Thomas Smith, and this is certainly the best chance we have of recognising the work of any lantern clock dial engraver. We cannot know why Thomas Smyth owed money to William Selwood, but engravers seldom became wealthy, and many sooner or later suffered from poor eyesight, even blindness, caused no doubt by working closeup in poor light or even candlelight. John Archer, working in Lothbury, free 1660-died c.1690, formerly a James Starnill apprentice and probably his successor. Daniel Beckman, working 'at the Golden Ball next to Mr. Maddox in Bell Savage Yard on Ludgate Hill', free 1680 -c.1705. Beckman was described at the time as a 'good-humoured man'. He was formerly a Charles Bonner apprentice. John Benson, working 1660-died 1700, a former Starnill apprentice. Charles Bonner, working Chancery Lane, free 1669/59-died 1682. John Destaches, working in Lothbury illicitly by 1646, banned by the Clockmakers' Company, then made free1661-62, then in Dublin by 1670. Richard Scrivener, working Fleet Street, 1640-1668. Thomas Stayner, working Fleet Street, 1654-62. John Thorowgood, working Fleet Street, 1661-62, a former Scrivener apprentice. Of all these our only likely engravers of these lantern clock dials, apart from Thomas Smyth already mentioned, were James Starnill and Richard Scrivener, as they were the only ones working early enough, i.e. pre-1660. After 1660 the choice is wider, and the likeliest man then was John Archer, who we know worked in Lothbury and what is more was formerly an apprentice of James Starnill and his likely successor. John Destaches, whose name was a constant source of difficulty for those who tried to pen it, was working as an engraver from 1646, when he was forbidden as a non-member to work at the trade (but did that stop him?) being finally made free of the Clockmakers' Company in 1661 but within a very few years had moved to Dublin. So we can begin to deduce which of these engravers were most likely to have been the ones to have done this work we recognise, but we don't really know and cannot pin any one piece of engraving down to any one engraver. 3. An example of the matchstick style single flower half-hour marker. Closer view. 4. 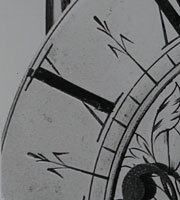 An example of the matchstick style double flower half-hour marker. Closer view. It is of course possible that the matchstick castings were made by one of these known clockmakers, and that he also supplied others in the trade. This is a little unlikely, as usually brassfounders and clockmakers each kept to their own specialities. These casting marks may have been reasonably visible when the casting was first supplied, though they may sometimes have been less than crisp. But most cast pieces had to be filed, sometimes drilled too or otherwise cut to shape, and this can mean that the casting mark has been scraped away to a varying degree, sometimes so that it is unrecognisable. Usually we have trouble spotting this mark even when we are actively looking for it. At first I totally failed to spot the matchstick man on the Selwood dial wheel, even though I was looking for it and had the clock apart for that very purpose. At first I took it for a blemish or fault in the casting. Only later when I cleaned it and looked with a magnifying glass did I recognise it for what it was. How much more difficult it must be for an untrained observer to spot such a mark. Most people looking at the mechanics of a clock, many restorers included, would not be expecting to find such a mark and would totally fail to spot it. So the fact that this mark has been recorded on relatively few clocks, does not necessarily mean that it was not there on many more, at least originally, even if filed away to be almost invisible today. This mark is probably much more common than we realise. In fact as I was in the very act of writing this piece, a colleague phoned to say he had just found no less than four matchstick man casting marks on a Peter Closon lantern clock he was cleaning. So what does all this tell us, if anything? Well it tells us that lantern clocks with matchstick man castings will very likely fall within the period 1640 to 1665, though perhaps as late as the 1680s. That lantern clocks with matchstick single flower, or double flower, chapter ring engraving fall within that same period. That most of them will be by London makers, and probably those in, or close to, or with connections to Lothbury. Even unsigned clocks of this period with these features can probably be assigned to London origins. It was not uncommon for London lantern clocks of this period to be sold unsigned by their makers in order to be retailed by others in the trade, or sometimes with a space left blank for retailers to add a signature. Occasional makers of lantern clocks of this period and with these features working away from London, probably bought their engraved chapter rings (and perhaps their castings) there. I have seen examples with matchstick flower chapter rings by Humphrey Clarke of Hertford, who trained in London, by John Lyon of Warrington who probably purchased his clock there for re-sale, by Humphrey Mills of Edinburgh, who also bought London-made clocks to re-sell, by Joseph Knibb in his Oxford period and by John Quelch of Oxford, who both had London connections. Other examples I have seen by for example William Risbridger of Dorking, Thomas Savidge of Exeter, Edward Webbe of Church Stoke, William Holloway of Stroud are probably explained by their having London connections or simply copying London fashionable style. So we keep looking and keep recording these little bits of evidence, each in itself of little use, but as we are increasingly able to add to our collection of scraps, a more rounded picture begins to form. And there is enormous pleasure to be found in uncovering such trifles of knowledge, to know that you are the probably first person in history to make a note of some obscure casting mark in a clock which has not been cleaned for a century or more. Only recently I owned a lantern clock by Thomas Loomes, uncleaned for a century, which proved to have a casting mark hitherto completely unrecorded - of a bell with a clapper. It's not quite like splitting the atom, but it's as close to that as I'm likely to get.